They together attract the mosquitoes, and trap them in a catch bag. A) The surface of the robust plastic bottom cover is riddled with small holes that direct the air plumes out of the trap. B) A shutter mechanism prevents the caught mosquitoes from escaping in case the power supply fails for any reason. C) The power supply cable can be directed through the lid. D) You can move the lid up and fix it with the hook on a hanger to work undisturbed on the net. E) An improved cable connection ensures water-tightness. F) We deliver two kinds of catch bags: a large catch bag that is attached to the ventilator, and catches the mosquitoes that are sucked in through the ventilator, and a small catch bag that is attached to the intake funnel before the ventilator. This one catches the mosquitoes before they are sucked in by the ventilator. This enables easier identification of the mosquitoes for monitoring purposes. Various sources of carbon dioxide can be used, and must be sourced separately. The carbon dioxide nozzle can be attached to a gas cylinder, to fermenting yeast, any well insulated dry ice container, or another carbon dioxide source that fits your preference, and that is placed away from the trap. 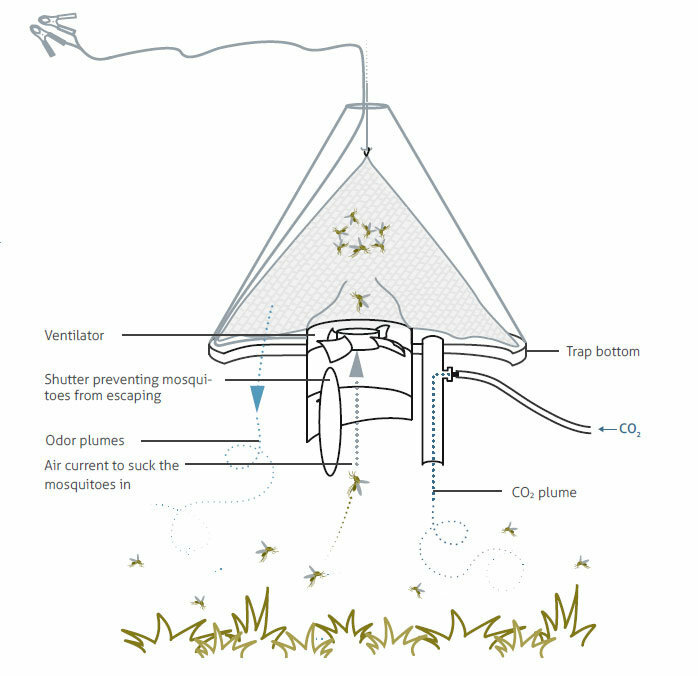 When CO2 is not available as an attractant, it might be a good idea to hang the trap close to a house where CO2 is directed outside from the residents. The correct placement of the trap is an important factor that heavily influences its effectiveness. Test different locations! 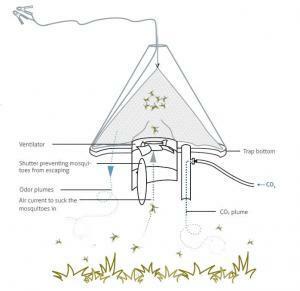 Position the trap in a location that is sheltered from wind, heavy rainfall*, and direct sunlight. Ideal locations to position the trap are close to resting areas of mosquitoes such as bushes, shrubs, hedges, or any other foliage. However, placing the trap in very tall grass or under bushes will impair its effectiveness. The trap should also be positioned close to mosquito breeding sites such as various kinds of temporary stagnant water ranging from small lakes to collections of rain water in rain barrels or old tires. Many mosquitoes do not need a large amount of water for breeding; even a can filled with rain water can be an ideal breeding place. When CO2 is not available as an attractant it might be a good idea to hang the trap close to a house where CO2 is directed outside from the residents. Verhulst, N.O., Bakker, J.W., and Hiscox, A. (2015). Modification of the Suna Trap for Improved Survival and Quality of Mosquitoes in Support of Epidemiological Studies. J. Am. Mosq. Control Assoc. 31, 223–232. Hiscox, A., Otieno, B., Kibet, A., Mweresa, C.K., Omusula, P., Geier, M., Rose, A., Mukabana, W.R., and Takken, W. (2014). Development and optimization of the Suna trap as a tool for mosquito monitoring and control. Malar. J. 13, 257. A price list can be found in the product catalog for professionals. The BG-Suna can be purchased by contacting our customer support by e-mail sales@biogents.com or by fax (+49 941 5699 2168). Cross section through the BG-Suna.